Work. Rest. Pray. is written by Richard Frost MBE. Richard started work as an employment advisor in 1979 and specialised in supporting people with mental health conditions to remain in work for Devon Partnership NHS Trust at Workways from 2002. Prior to that he worked for what is now Dept for Work & Pensions including working in Jobcentres helping people who were long-term unemployed and those who have a disability. In his work for the NHS he led Mindful Employer, an international ground-breaking initiative helping employers to support staff experiencing mental ill health launched in 2004. Richard moved on from this work in December 2018 to begin the next stage of life (some call this ‘retirement’). Showing how it’s never too late to learn, having failed A-levels at school, he passed his driving test at the age of 38 and 15 years later, gained an MSc Vocational Rehabilitation. In this next stage of life he is learning to play the piano and to paint… well, let’s see how that goes. Richard was appointed an MBE in the Queen’s Birthday Honours 2018 for services to mental health. 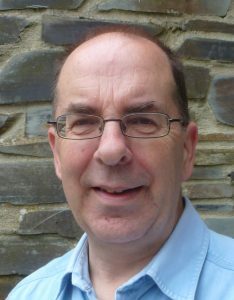 A Christian since 1979, Richard has been a Reader (lay minister) in the Church of England since 2003 and is an Oblate (a ‘third order’, lay member) of the Anglican Benedictine Monastic Community at Alton Abbey in Hampshire. Married to Jane, who is a priest, they live in Devon with their cocker spaniel, Pip and have two grown-up children. Life with St Benedict, a book written by Richard which provides daily reflections on the Rule of St Benedict is to be published by BRF in September 2019. Richard is a member of the Association of Christian Writers. New posts will be published about once a fortnight or so. If you’d like to be notified, simply enter your email address in the subscribe box below (it’s free & secure).